I drove up to San Francisco this morning to record a short segment for KQED’s Pacific Time (88.5 FM). Part of Thursday’s show at 6:30 pm will talk about Yul Kwon’s victory on Survivor. I was contacted by the producers on Monday after they had read my post on Yul. Over the next two days, I collected and developed my thoughts about his win and its significance to the Asian-American community. Thanks to Rae, Daniel, Felix, Mike, and Joon-Mo for their great comments and suggestions! The recording went without a hitch, and I was in-and-out in about 30 minutes. If I sound a little nasally on the radio tomorrow, it’s because I’ve been fighting a cold for the past few days! I’ll post a transcript of my commentary after the show airs. Check your local listings to see when Pacific Time broadcasts in your neighborhood. Otherwise, the KQED website will eventually post a link to the podcast for the show. I’ve had some memorable radio experiences in the past. In 1990, I won tickets to the Festival of Animation at the La Jolla Museum of Contemporary Arts for being caller number eleven on B100 (now Star 100.7 in San Diego). A few years earlier, I had won the soundtrack to Good Morning Vietnam — on vinyl no less — along with four movie tickets. I even tried my hand at on-the-air singing! 91X was giving away tix to a Billy Bragg concert to the caller who could best sing Bragg’s 1991 single Sexuality. Anyone who has ever heard me sing would know this, but suffice it to say, I didn’t win the tickets. I just might have broken a few radios in San Diego along the way! Another radio moment came in 1998, right after the Newton’s cancellation by Apple. I was interviewed by John Gordon from Minnesota Public Radio, and I think I came across as being level-headed and intelligent, not a raving Newton lunatic as others have humorously described me. Finally, when I was a Digital Vision Fellow, a group of us went to do a Tech Nation segment with Dr. Moira Gunn. However, there were six of us but only five seats in the recording room. I was the odd man out, and I spent the show photographing Stuart, Steve, Tino, Segeni, and Brij as they discussed their fellowship projects. I’ll have to say that after today, I think I like being in front of the microphone better! 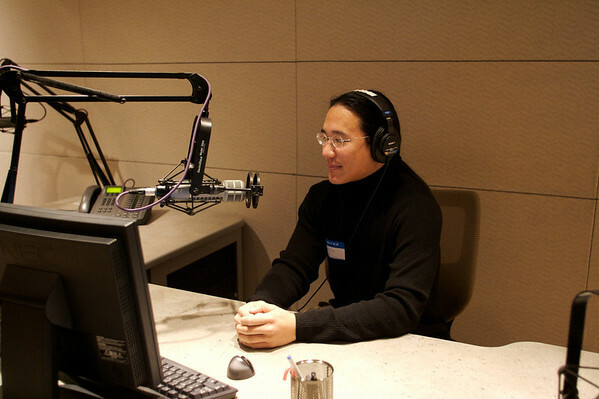 Here are some photos from the recording at KQED in San Francisco today and two years ago with the Digital Vision group. I’m looking forward to hearing the broadcast!